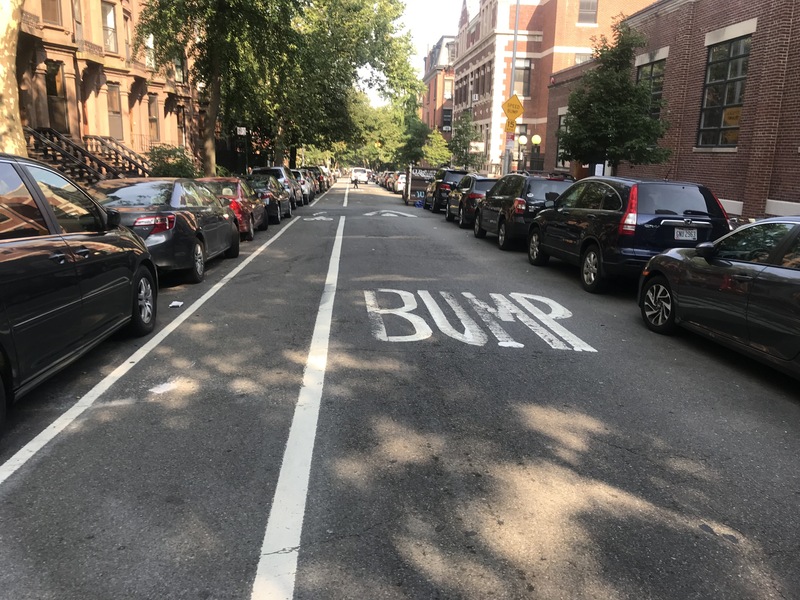 Someone wrote the word "BUMP" just too damn big to accommodate the bike lane. Here’s today’s metaphor for how America’s car-centric culture sees cyclists: In the way. Contractors for the Department of Transportation recently repaved Schermerhorn Street between Court and Clinton streets in Brooklyn Heights — but the person who restriped the roadway not only forgot to repaint the bike lane, but he or she also wrote the word “BUMP” so wide that the work will have to be done all over again if the city restores the cycling path (photo above). Why does the city accommodate drivers to the point of alerting them when a speed bump is coming up in the first place? Let drivers navigate the streets slowly and cautiously because a bump or hump could appear at any time. Speed bumps are way overblown as a traffic-calming device anyway, but where installed cyclists should be afforded a way around them. The DOT needs to know when the striping is done wrong. As I understand it, they hire contractors and will withhold paying the contractors for work that is done wrong. If on the other hand the bike lane was supposed to be removed, the lack of needing to inform the community is frustrating and unfair. When bike infrastructure is to go in, there is an extensive community process; but there is no corresponding process for when bike infrastructure will be reduced/downgraded/eliminated. I agree with this. The efforts to expand bicycle lanes should focus on wider, faster streets. For these streets, there should be several speed humps. Yeah, it’s the kind of lane that got a cyclist creamed the other day by a garbage truck. Cyclists are probably safer on this street without inviting close passes. Yes, on streets like this I generally take the lane. The presence of a bike lane makes drivers think I should squeeze over to the right or left so they can pass when there’s not enough room to safely pass. Narrow streets like these need to have parking on only one side of the street and a jersey barrier protected curbside bike lane on the other. 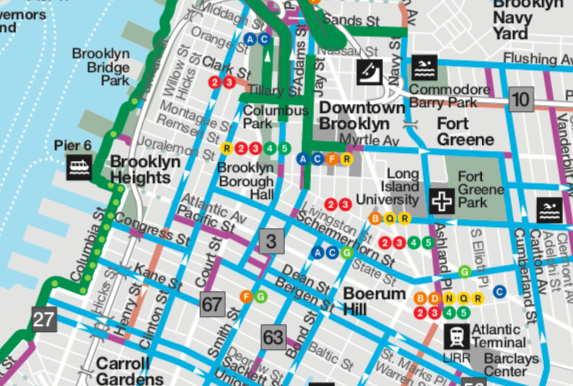 The Downtown Brooklyn Partnership now has 56 planters maintaining the integrity of the Jay Street bike lane, up from 12 in early 2017.